Welcom to Warren’s main drag! “There is no city in the world where the inhabitants are more immersed in a premium lifestyle than in New York,” now-former Cadillac CEO Johan de Nysschen told The Wall Street Journal in 2014. And truly, the same can be said of the company’s new hometown, Warren. In Michigan. Just look at the picture above, and bask in its very own premium lifestyle. Now that de Nysschen is out, the brand is leaving, pulling up its shallow roots in the Manhattan neighborhood of Hudson Square (they claimed it was SoHo, but the New Yorkers here have informed me it was the much more corporate Hudson Square), and returning to the pleasant peninsula that birthed the brand. Cadillac’s leaders couldn’t have chosen a more spectacular metropolis as a follow up life in New York than Warren. And as a lifelong resident of Metro Detroit and a traveler of the tri-county area in general, I am uniquely qualified to take GM on a dazzling virtual tour of this fair city. With a population of just under 135,000, this busy town is the third largest city in Michigan, and Detroit’s largest suburb. It’s also the location of the General Motors’ Technical Center, making GM the largest employer in town. So welcome home Cadillac, you’re now where every body knows your name, so let’s get to know Warren a little better. Michigan is a state dotted by beautiful lakes, but luckily you won’t find them here. Stroll the grid of four-lane wide streets with careless ease along Warren’s perfectly flat landscape and drink in the world-famous sights, such as the Warren Community Center, built in 2003, or the Warren Stamping Plant and Truck Assembly Plant, where Chrysler makes parts for Dodge Grand Caravans, Dodge Durango, Chrysler Pacifica, Jeep Grand Cherokee, Jeep Cherokee and Ram Trucks. See? It’s not just General Motors in Warren. Talk about economic diversity! Music lover? Drop by Continental Communities, the trailer park where the Eminem film 8 Mile was filmed. While this isn’t the same trailer park where the rapper once lived (that’s farther into the heart of Macomb County in a place called Clinton Twp.) it is where the film was shot. It’s even actually on 8 Mile! That’s one thoroughly authentic town! As for your evening hours, dinning comes in two fabulous flavors; middle eastern and classic American. Dine in a Big Boy that shares the same zip code as Big Boy Headquarters. That’s how you know its fresh! And of course, there’s always the old South East Michigan standby, the Coney Island (a kind of diner that offers Greek inspired diner food) nearby. In fact, there’s 12. Twelve different Coneys where you can order chili fries and gyros. Try one every month to keep things interesting over the next year! If the finest chicken fingers wrapped in melted American cheese nestled in a pita doesn’t tempt you, there are plenty of pubs and diners serving up a rainbow of different burgers and fries combos. Warren even has an Applebee’s and a (poorly reviewed on Yelp) TGI Friday’s. Yes, no matter how you prefer to have grease delivered to your insides, Warren has it. It’s time to paint Warren red! (Though you don’t really have to, the overwhelming white population of Macomb County voted for Trump in 2016 and was the linchpin to turning the usually solidly Blue state Red.) Be sure to hit up Tipsy McStaggers for a night of darts, drink specials and karaoke. If you have a problem with your Cadillac five years from now, know that major decisions concerning your car were made in the same hometown as Tipsy McStaggers. If billiards are more your speed, Hot Shots is the place, with an authentic “90s sports bar” atmosphere. Kozy’s Lounge is another hot Warren pool spot with authentic “90s sports bar” atmosphere. As is Sporty O’tools [sic]. Basically if you like dank sports bars that haven’t been redecorated in nearly 30 years, Warren is for you. There are all sorts of ways to spend time—and some of that Cadillac money—in Warren! Universal Mall features brand names like Target and Burlington Coat Factory. Value World Consignment is perfect for curating that hip look that just screams “I’m wearing clothes that didn’t manage to sell out of the estate sale of a line worker.” There’s also the always fashion-forward (and increasingly hard to find) K-Mart, another Michigan favorite. There’s also the Produce Palace, which features a 90-foot meat counter. A whole 90 feet! New York doesn’t have room for 90 feet of anything. Sure you could leave lovely Warren and make a short drive on I-696 to the hip nearby neighborhoods of Ferndale, Royal Oak or even Detroit, but why would you? 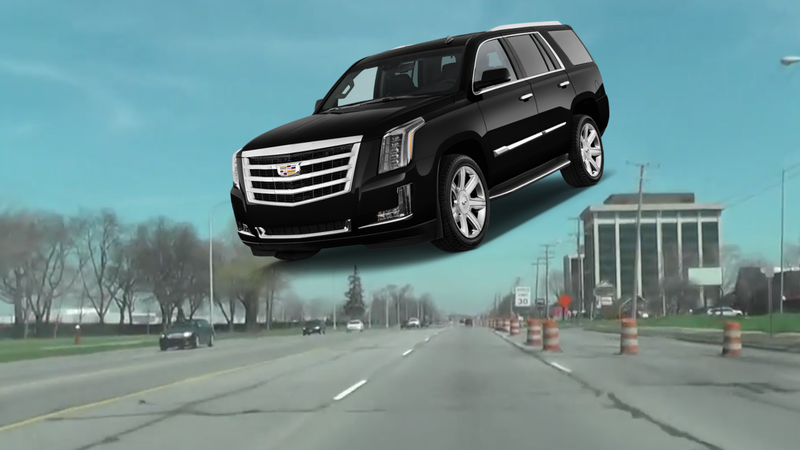 Warren is where it is at, and Cadillac is just another ostentatious feather in the city’s already heavily plumed hat.